Weighing jewelry, gems and precious metals require an extremely sensitive piece of equipment. Due to the intrinsic value of these goods, a scale of inferior technology will translate to loss of revenue. This is where Arlyn Scales can step in to help those with the need for ultra accuracy. We have ultra precision scales designed to meet the needs of jewelry and gem business operations. 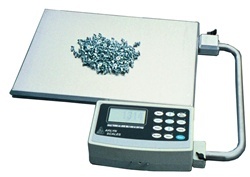 We manufacture many of the scales we sell. This has given us the expertise to cater to and handle the specifications needed by different industries that see a gap between the typical types of scales offered on the market and their own specifications for what they actually need to get their operational tasks done most efficiently. Our ultra precision scales take the form of bench scales, so they can be easily mounted on a desk or some other eye-level location perfect for the weighing of jewelry and gems. We have developed Surface Acoustic Wave technology that offers you super sensitivity. These scales will detect any force, distortion or vibration caused by the act of the load being placed onto the scale platform. It will then immediately compensate for this in the way that only a digital scale can, to yield a stable reading of a gem’s mass that is 20 times more accurate than a normal bench scale! An Arlyn Scales ultra precision model also comes with all the convenience of a fully functioning digital display. It will have tare functions, including zero for easy calibration, a large LCD display for optimal viewing, automatic zero tracking, stability control, 15 different weighing units (so you can use it to efficiently conduct transactions with business partners from all over the world), and it also comes with parts-counting and check-weighing functionality for the utmost convenience. The best part? Your ArlynScales Ultra Precision scale comes with an accuracy of 0.005 % and an internal resolution of up to 1 part per 2 million! Another great feature that gem and jewelry makers and dealers will enjoy is that it is solidly made by Arlyn Scales to last the lifetime of their business. It is basically made with a die-cast aluminum frame (with no moving parts), click switches, (that don’t wear out as fast as other types of switches) and the weighing pan itself is made of stainless steel for the utmost durability. We are so confident about how well made our ultra precision scales are that we back them up with a 3 year warranty. In addition, there is no set up required and it will can be performed with an automatic function. If you want even more from your scale than this, we can load it with custom software applications to monitor, batch and deliver your weight data to a computer nearby, so you don’t have to record as you weigh, and then input the data separately into a computer database. We have different options available to allow you to take advantage of this, from our USB Remote software to our RS485 Remote software, among others. The choice is up to you. If you need to weigh precious gems, metals and jewelry, don’t trust your bottom line to a regular bench scale, contact Arlyn Scales today to get your hands on an ultra precision scale instead.